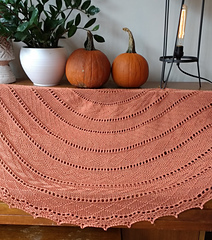 Pumpkin Spice is a large crescent shaped shawl made up from different gansey patterns with a flowing lace edge and a picot bind off - perfect for wrapping up in now we’re having cooler weather! We’re welcoming in Fall by hosting a Pumpkin Spice KAL on the Fans of Wolle’s Yarn Creations Group. The KAL will begin Nov. 1st please come and join us!